The RedPlanet had a fiery and watery past. New research reveals that beginning about 3.5billion years ago, five episodes of violent volcanic activity spewed lava andhot water onto the Martian surface, sculpting the landscape into the dimpledworld we see today. Unlike onEarth, researchers say, the fashioning of the Martian surface has proceeded inspurts and stops. The rocky slabs that form Earth's outer surface steadily inchalong to mold the mountains and valleys that shape our planet. Theresults, presented last week at the Lunar and Planetary Science Conference atLeague City, Texas, depicted periods of volcanic activity alternating withrelatively quiescent stints on Mars. "Wenow have good evidence that volcanism on Mars and the release of water was notat the same level at all times, but it was episodic," said Gerhard Neukum ofFreie University of Berlin and principal investigator for Mars Express, thespacecraft which returned the data behind this study. Neukum and hiscolleagues analyzed images from the High Resolution Stereo Camera (HRSC) on Mars Express.In order to estimate the ages of volcanic material on Mars, Neukum's teamcounted the number of small craters carved into the surface. The older thesurface, the more craters it would have accumulated as meteorites of all sizesbombarded its surface. "Wecan now determine the ages of large regions and resurfacing events on theplanet," Neukum said. Resurfacing occurs when volcanic eruptions spreadlava across the planet?s surface. From thistechnique, the team estimated five volcanic periods: ?3.5 billion years ago,1.5 billion years ago, between 400 million and 800 million years ago, 200million years ago and 100 million years ago. The dates of the earlier episodes,Neukum estimates, are correct to within 100 million to 200 million years andthe later dates are correct to within 20 million to 30 million years. The mostrecent activity on Olympus Mons,Mars's largest volcano, occurred at the summit around 150 million years ago with minor flows in some areas as recent as 2 million years ago. Neukum added that peaks in eruptions of the volcano match the dates his team foundfor global volcanic activity. The team alsoinvestigated two large channels, Kasei Valles and Mangala Valles, revealingepisodes of water flow that roughly match the times of high volcanic activity. 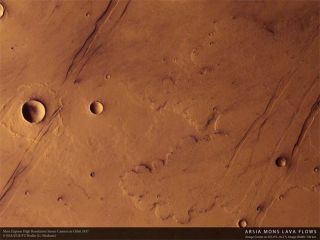 "Sowater flowed over the surface of Mars not just at the beginning but again andagain throughout its history," Neukum told SPACE.com. The burstsof volcanic activity could be explained by plate tectonics, or lack thereof.Whereas Earth is covered with a puzzle of rocky slabs called plates, Marsis a one-plate planet. Over time,heat from Mars's interior builds up and can cause the crust to crack in someareas, releasing fiery magma (called lava when it reaches the surface). Theinternal heat generated by the volcanic activity also may have caused water toerupt from the interior, leading to wide-scale flash flooding. Theseepisodes might not be over. ?Theinterior of the planet is not cold yet, so this could happen again,? Neukumsaid. But the chances of Mars Express or another orbiter spying such events areslim, because the eruptions happen much less frequently on Mars than on Earth,he added. "So Marsis not dead," Neukum said.